AGENTS - this is in PLN in MLS. 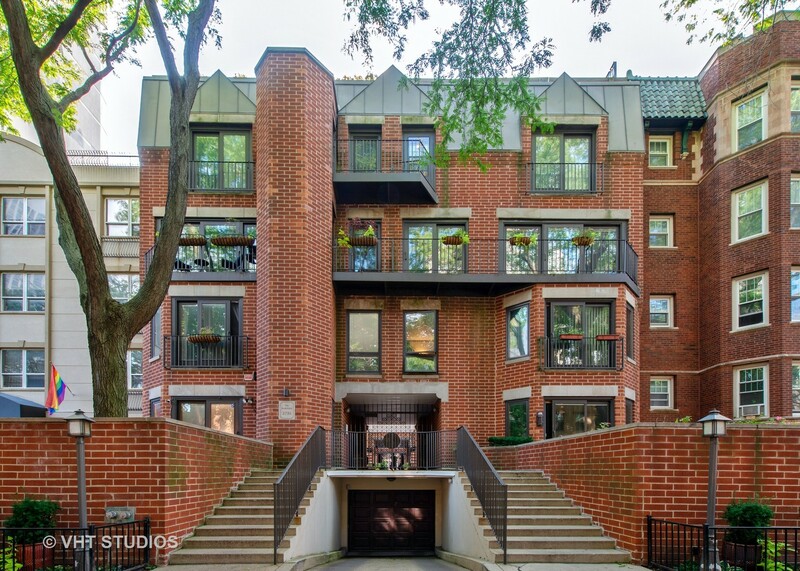 NOT YOUR COOKIE CUTTER LINCOLN PARK 3BR/2.5BTH DUPLEX UP -RENOVATED - CHARM MEETS MODERN-PRIVATE ROOF DECK w/360 degree City view! BR'S SAME LEVEL! ONLY UNIT W/ 2 WBFP's. Heated GAR & STRGE included! OPEN LR/DR/FAMRM W/WBFP HI END CUSTOM LUXE cabinetry w/Carrera marble counters, backsplash & hearth (17K) Restoration Hardware fix. NEW FLR -CEILING WINDOWS W/LARGE Balcony off LR. OPEN CHEF'S KIT W/WHITE 42"CABS HI END FISHER PAYKEL fridge/2 DRAWER DW/Bosch stove. GRANITE counters & full height backsplash. Sizable PANTRY! GRANITE ISLAND- FRML DR functions as Office/den/Lib/Play rm. MABR w/2ND WBFP - organized CUSTOM reach-in closets(6k) Full baths w/ Perrin Rowe fixtures & American Bath jet claw foot tub. MABTH w/luxe step-in shower & dual vanity! Recessed lights! Hi end W/D. Custom Silk drapes. Interior stair roof deck access. Nu tankless on demand hot water! 2 SHORT BLOCKS TO PARK & LAKE! MARIANOS-TRADER JOE! GATED ENTRY -16 UNITS WELL MANAGED ASSOC! Property information last modified by seller on Saturday, December 22, 2018, 09:45 AM CST. Information Deemed Reliable But Not Guaranteed. Unauthorized duplication, use, or linkage is prohibited. The information on this web site is for personal, non-commercial use and may not be used for any purpose other than to identify prospective properties consumers may be interested in purchasing. Monthly Payment Calculator results are for illustrative purposes only, not a financing opportunity; calculations assume a 30-year fixed-rate mortgage and do not include closing and other costs. Property Tax on NEW properties is estimated at 1.5% of Listing Price for payment calculation purposes; actual value may be higher or lower.